New Warriors (vol. 4) is a series lasting 20 issues from 2008 to 2009. It is set in the aftermath of Civil War and during the Superhuman Registration Act era. It features a team of mutants who lost their powers during M-Day. A televised fight in Stamford between the reality television stars New Warriors and a group of villains turned into a disaster when the villain Nitro created an explosion, killing the New Warriors Night Thrasher, Microbe and Namorita as well as more than 600 civilians. This event led to the superhuman Civil War and the implementation of the Superhuman Registration Act. Night Thrasher's brother Donyell Taylor, donning the Night Thrasher guise secretly, formed a new team of ex-mutants and runaway children in defiance of the Superhuman Registration Act, performing heroic deeds despite not being registered. Night Thrasher attempted to recruit Sofia Mategna, formely Wind Dancer, but she refused. The team lost one of its members Longstrike during a battle with the new Zodiac. Sofia arrived to help the team defeat Zodiac and finally joined the team, persuading Night Thrasher not to disband the team despite Longstrike's death. Field leader Jubilee became suspicious about Night Thrasher's intentions after he kept disappearing in the middle of battles. 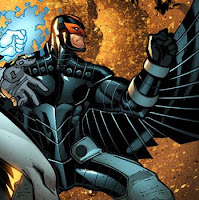 Aware of Jubilee's suspicions, Night Thrasher and Kaz created the transhuman activity monitor which Night Thrasher claimed predicted that the Machinesmith was about to create a new techno-organic virus. During the fight against Machinesmith, Night Thrasher left to find the Machinesmitsh's nannites. Half the team was trapped with the foe but they managed to fight their way out before Night Thrasher led the escapees back to rescue their teammates. When the alien Skrulls invaded Earth, Night Thrasher traveled to his old safe house in attempt to search for clues to whether the New Warriors who died during the Stamford disaster might have been masqueraded by Skrulls and that his brother might be alive. He was followed by his team and members of the older New Warriors teams (Justice, Rage, Ultra Girl, Stapstick, Scarlet Spiders, Debrii) who clashed. The fight ended when he revealed his true identity as Donyell. Both teams combined to retrieve the bodies of the dead New Warriors from a helicarrier, giving them a burial. The team was attacked by a S.H.I.E.L.D. task force tasked with their capture and during the fight, Ripcord and and Skybolt were killed in an accident. With the mystical artifacts that he asked his old enemy Midnight's Fire to obtain for him, Night Thrasher activated a time machine he had created to travel to the past to prevent the Stamford disaster. However, the team ended up in a future in which Iron Man is the dictator of America and all the heroes were sent to the Nth dimension. 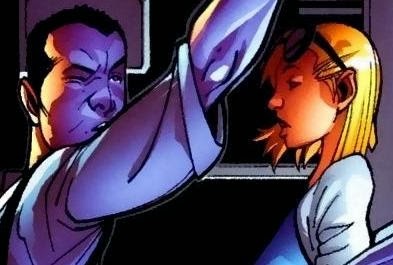 Night Thrasher left the team and infiltrated Stark/Taylor Tower where he discovered the Iron Man was actually Dwayne Taylor, his brother seemingly alive. 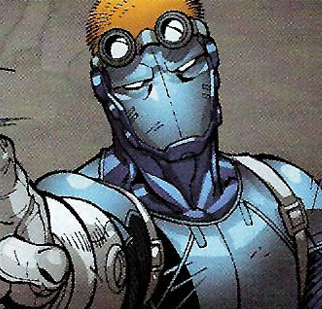 The team was rescued by Night Thrasher, who revealed himself to be Tony Stark. Stark told the team about how Dwayne returned to life as a proponent of the Superhuman Registration Act and took over control of the Initiative, starting more drastic measures to remove the superhuman population to the Nth dimension. 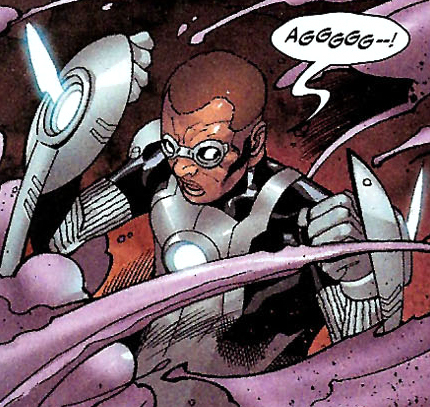 Stark led the team to take the fight to Dwayne to find the time machine. The team was captured but was later released by Donyell who was unhappy with Dwayne's conduct. In the ensuing fight, Donyell killed Dwayne and returned to the past with his teammates. Back at their present, the team disbanded. Donyell is the half-brother of the original Night Thrasher, Dwayne Taylor and the product of an affair of his father Daryl Taylor. Donyell resented Dwayne for having the money and family he never had. 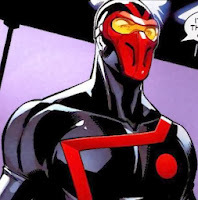 As Bandit, he targeted Night Thrasher's foes to prove that he is superior. He also took away Night Thrasher's girlfriend Silhouette. He later joined a team of New Warriors and reconciled with Dwayne. 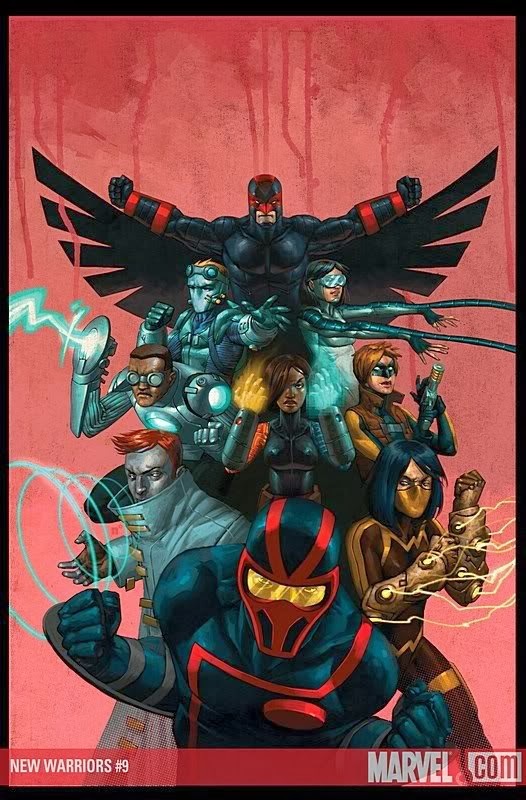 Following the death of Dwayne during the Stamford disaster, Doynell assumed the guise of Night Thrasher and formed a team of New Warriors. After the team disbanded, he joined the Counter-Force, later renamed the Avengers Resistance, a team of former New Warriors that opposed Norman Osborn who was then the director of national security. When Chamber's powers manifested, it blew a hole in his face and upper body. 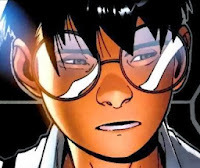 He traveled from his home in UK to US to enroll in the Xavier Institute and join Generation X. He was often moody and was unable to return fellow Gen X-er Husk's affections. Just before Generation X was disbanded, Chamber was invited to join the X-Men. He eventually left active duty. He was soon asked by X-Man Wolverine to infiltrate Weapon X. Weapon X was able to repair restore his face and upper body. However, when the Scarlet Witch depowered 90% of the mutant population during M-Day, Chamber was one of those affected. With his face and upper body missing yet again, he was place in a life support in hospital until he was taken by the Clan Akkaba, an organization with ties to Apocalypse. Chamber is revealed to be a descendant of Apocalypse and Clan Akkaba restored Chamber's face and upper body. However, Chamber now had characteristics similar to that of Apocalypse. While there were hints that Chamber might have gained omega-level mutant abilities, he next turned up as a member of New Warriors, with technology granting him the ability to create solidified sound constructs. After the New Warriors disbanded, Chamber turned up at Utopia. In the Age of X reality, Chamber's old powers kicked in, his face and upper body was blown off again. He retained this look after the Age of X reality reverted. Sofia was born in Caracas, Venezuela. While under the care of her uncle, Sofia's mother was killed in a riot in town. Her uncle refused to take care of her, so she was sent to her father, who had previously not aware of her existence. Her father Walter Barrett was an occupied businessman with no time for her daughter. After hearing someone say that no one liked her behind her back, she snapped. Going to one of her father's stores, he let loose a hurricane inside it, completely wrecking it. She was visited in jail by her father and later Dani Moonstar, who persuaded Walter to release Sofia into her custody. Dani enrolled Sofia into the Xavier Institute. Sofia became good friends with Laurie Collins and David Alleyne, rebuffing the romantic advances of Julian Keller. The friends became part of the New Mutants student squad and Sofia became leader. Sofia later persuaded David to be co-leader. Sofia lost her powers after M-Day and left the school with her father's former manservent Derek. 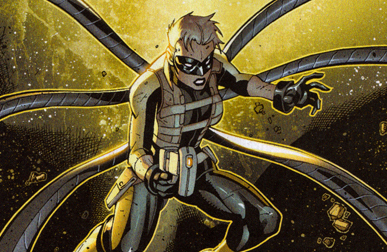 She eventually joined the New Warriors team as Renascence, wearing a suit with six mechanical tentacles and electrically charged talons with a personal force field. The team has since disbanded. Beak and Angel had a relationship which resulted in her giving birth to six children. When he disagreed with Kuan-Yin Xorn's ways while in the Brotherhood, he escaped and found his way to Cyclops. 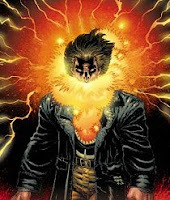 Joining Cyclops' ad-hoc X-Men team, he assisted in stopping Xorn. Beak was depowered during M-Day. He was given a costume with technologically based powers and served as Blackwing in the New Warriors. 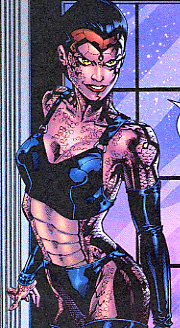 Angel was caught by the U-Men but rescued by Wolverine and brought to the Institute. She was placed in the Special Class where she had a relationship with fellow student Beak which resulted in her giving birth to six children. Angel was depowered during M-Day. 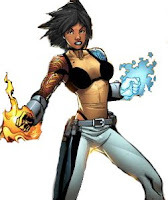 She was given a costume with technologically based powers and served as Tempest in the New Warriors. Stacy X worked in the X-Ranch, using her pheromones powers to induce bliss. 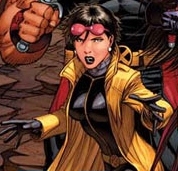 The X-Ranch was targeted for destruction by the Church of Humanity and she was rescued by the X-Men. She joined the X-Men where she was attracted to Archangel. When her affections were not returned, she left the team. She was depowered on M-Day after which she joined the New Warriors and given technological-based powers. She was believed killed during an accident in a fight against a S.H.I.E.L.D. task force but turned up alive subsequently. Redneck was in the Omega Gang that caused a riot in the Xavier School. He lost his powers after M-Day. He joined the New Warriors team as Skybolt, using weaponry and flight pack derived from the designs of the Beetle. He was killed during an accident in a fight against a S.H.I.E.L.D. task force. Radian and Tattoo are siblings. 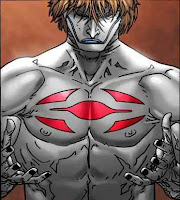 Radian was in the Omega Gang that caused a riot in the Xavier School. Radian lost his powers after M-Day. Christian joined the New Warriors team as Phaser, generating intense bursts of energy from the chest of his armor as well as deflecting energy through specialized gauntlets on his arms. Tattoo was in the Omega Gang that caused a riot in the Xavier School. Tattoo lost her powers after M-Day. 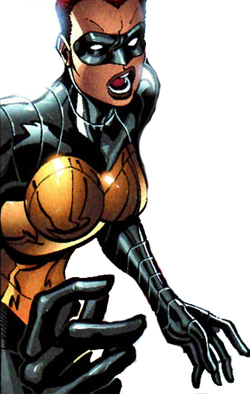 She joined the New Warriors team as Longstrike, using a version of the Stilt-Man armor which allows her to elongate her limbs and enhance her strength. She was killed in a battle against the Zodiac. Kaz, Aja and Grace were runaway kids picked up by Donyell to assist him in the New Warriors team. They are adept at technology.